Another installment of Threat Assessment for you boys and girls as I bring you the latest update to one of the beasts I wrote up back in the Beta period of the Edge of the Empire roleplaying game. Today I give you a look at the diminutive, but incredibly potent kouhun. This may be the last sight you see. Or more likely won’t see. 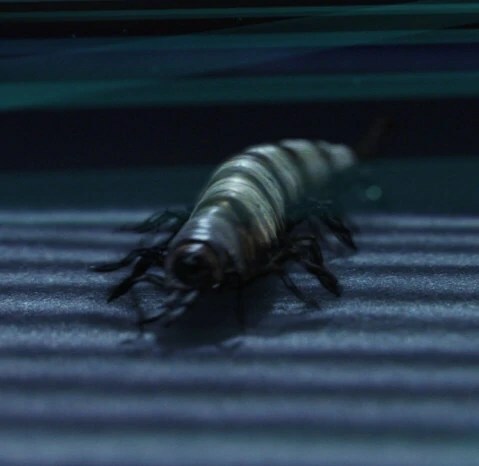 Tiny, predatory, centipede like insects around 30 centimeters long, the kouhun are native to the jungle planet of Indourmodo, though they are capable of surviving in most any environment except for extreme cold. Small and swift moving, they also possesses an incredibly potent neurotoxin that can dispatch targets quite quickly. As a bonus, the effects of the poison mimic the effects of cardiac arrest in most sentient species, which makes this creature a very popular choice of weapon for assassins, bounty hunters, and other folks of ill repute. In addition, the kouhun’s natural white coloring meant they were often able to be dyed in the dominant color of the target’s surroundings, making them that much harder to detect. Star Wars is rife with the intrigues of governments both in wartime as well as in the tenuous peace times. 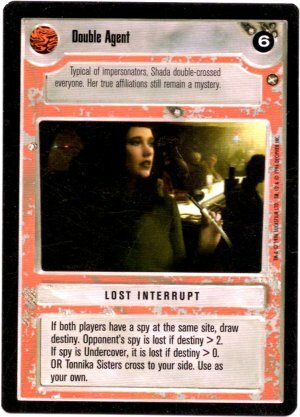 It is also rife with spies, from the [in]famous Bothan Spynet to Imperial Intelligence and Rebel Agents. One of the more dangerous archetypes in the world of intrigue is the double agent, the counterintelligence specialist who “works” for an organization as a spy, while in fact, they are a member of the organization they are being paid to spy on. In Star Wars Saga Edition, we’re provided some great little talents in the Clone Wars Campaign Guide to build a nasty little double agent that can be a major thorn in the PCs sides by making them unable to be targeted. The following builds key off of one talent – Double Agent. This mind-affecting effect allows the character to make a Deception check against the Will Defense of every enemy they can see when initiative is rolled. If the check is successful, those targeted do not treat the character as an enemy until you attack or obviously harm or hinder them. This allows them to use Feed Information (and/or Spotter depending on what level of the build you’re using) to toss enemies and allies bonuses in combat, allowing them to remain non-targets during the combat encounter, and Rapport lets them toss bigger bonuses to aid another checks. The higher level build also features Blend In, which gives the character the ability to gain total concealment as long as they are adjacent to at least two other creatures, meaning that they can still stay protected even after their cover is blown. This NPC, when used effectively, can be a major thorn in the characters’ collective sides during combat by buffing their allies without needing to worry about protecting their own arses. 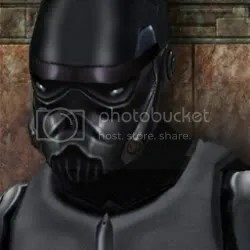 First encountered in Star Wars Jedi Knight II: Jedi Outcast, the Shadowtroopers were the next evolution of the Reborn. Created by the Dark Jedi Desann and Admiral Fyyar and imbued with Force powers by the Valley of the Jedi, these soldiers fought with single-minded determination for Lord Hethrir’s Empire Reborn, cutting their opponents down in silent fury, showing remarkable skill with the lightsaber. Like the Reborn soldiers, the Shadowtroopers were not strong Force users, possessing only rudimentary knowledge of the dark arts. However, their armor was created with a special crystal, known as the Artusian crystal, which amplified their power over the Force to a small degree. Coupled with their suits stealth systems, they made the perfect covert and special operatives for the Empire Reborn. Artusian Crystal – The shadowtrooper’s armor is embedded with a special type of crystal that amplifies their power over the Force granted to them from the Valley of the Jedi. It grants them a +2 equipment bonus to Use the Force checks and allows them to treat their Wisdom as if it were 2 points higher for purposes of the Force Training feat. This ability will not function for those that do not draw the source of their power from the Valley of the Jedi. Here were are with a new droid model. I wanted to capture the feel of a “sword and board knight” in the Star Wars universe. I think this droid does the idea justice. The Droid Cavalier was a failed experiment at the end of the Clone Wars. They were produced in limited numbers as first run experiments with the newfound crystaduranium armor, and were built to be bodyguard droids for generals on the field of battle. They were meant to inspire fear into the hearts of those who viewed them, and hearken back to the days of old when battles were still decided by skill with a blade. However, the Clone Wars ended soon after production began, and so very few of these droids were ever made. Estimates put the numbers anywhere from several thousand to only several hundred. From time to time, one or two have surfaced in the role of bodyguards and enforcers for extremely wealthy nobles and crime lords. However small the production run and despite the official failure given to the project by the Techno Union at the end of the Clone Wars, they proved to be devastatingly effective at their programmed job, able to draw opponent’s attention to themselves instead of their charge, shrugging off otherwise debilitating hits, and even putting themselves in harms way when an errant attack does reach their charge. They move with a preternatural quickness and grace, despite their heavy armor, acting with deadly efficiency. The following is an example of how quickly things can steam roll in my head. When I sat down to start this edition of Threat Assessment, I was just planning on putting together a couple of stat blocks. However, after I started with the NPCs, I started coming up with backstory to tie them together. From that sprung a new organization, a Force Tradition and associated talent tree, and a planet for them to inhabit. There’s quite a bit to this post, so I’m not going to deal with much more preamble and get right into the meat. 10 – Niss, a small backwater planet was discovered and catalogued in the early days of the Old Republic. 15 – Since time immemorial, Niss has been controlled by various warlord and tyrants, keeping the planet in an almost constant state of civil war. 20 – Though Niss has no major exports or industry to speak of, a rare vein of ore runs through the mountain range circling the middle of the planet that makes a very strong metal alloy. 10 – The people of Niss have a strong patronymic society, and they trace their people’s history back to a figure known as the “first father.” It’s unknown whether or not this is an actual historical figure or not. 15 – While they have access to the technology, most of the natives of Niss believe it to be an affront to personal strength to rely on blaster weaponry, and thus, most warfare is still conducted hand to hand. 20 – A small number of the Humans living on Niss, while appearing similar to Humans in most every respect, are actually genetically different than those in the rest of the galaxy, making them a different species. Enemies and Allies: The Order of the Black Wind doesn’t have any allies on planet, but any dark sider who follows the same philosophies might find an ally in the organization. There are several large areas of Niss controlled by powerful warlords who want to see them destroyed and have clashed militarily with them in the past. Organization Score Criteria: To belong to this organization, one must possess a rudimentary knowledge of the dark side of the Force, even if they are not Force sensitive. A character cannot begin using organization criteria or gaining the benefits of an Initiate of the Black Wind until he has successfully made contact with the organization and been accepted into their ranks. Titles, Benefits, and Duties: The Order of the Black Wind expects all of its members to provide military service should it become required. They are also required to donate all of their material wealth to the organization, who in turn, provides the basic needs of each of their members. Finally, they are required to take part in various rituals designed to strengthen the hold of the dark side in their area of operation. 1 | 10-19 | Initiate: An initiate is the lowest ranking member of the order. Through their training and indoctrination, they gain a +2 bonus to their Will Defense against enemies of the organization. 2 | 20-29 | Acolyte: An acolyte is a member of the organization who has completed more training and has a deeper understanding of the Force and the philosophy of the group. His encounters with enemies of the group and their zeal in serving give them a +1 circumstance on attack rolls against enemies of the organization. 3 | 30+ | Hierophant: A hierophant is the highest rank in the Order, one who has completed his training and has a deep level of understanding in the Force. Those who achieve this rank receive access to a personal aide who has heroic levels equal to their heroic level -3. During the Golden Age of the Sith, a powerful Sith Lord by the name of Thraxuss took off for the Unknown Regions, and found himself in a system with a lone planet circling a sun. Landing on the planet, he quickly found himself a subject of great interest from the locals, whom were much less advanced than he was. He took advantage of his powers and quickly bent the leaders of several of the tribes to his whim, ruling over them like a God Emperor and passing on some of his teachings to several powerful apprentices. When he died, his body was placed in a tomb carved into the base of the largest mountain on the planet. His apprentices plunged the planet into a bloody civil war after his death as each of them struggled to take over Thraxuss’s entire empire. Meanwhile, the galaxy continued on as it is wont to do, and the people of Niss advanced to join the rest of the galactic civilization, and eventually Lord Thraxuss was forgotten. One day, a young man named Rath Traynor, strong in the Force stumbled across the tomb, where Lord Thraxuss had been buried along with all of his teachings and several of his artifacts. Armed with this knowledge, equipment, and his own violent nature, Rath was quickly propelled down the dark path. Before long, he had begun to follow in the ancient Sith Lord’s footsteps and had taken over several large areas of the continent, controlling the government leaders like puppets. The power of this dark side cult has never reached beyond the planet of Niss. The planet, while registered in the galactic database, doesn’t have much to offer the galaxy at large and thus still several steps behind the rest of the galaxy. Lord Thraxuss drew upon several of the basic emotions that Sith Warriors called upon to aid them in battle: specifically the emotions of rage and anger. He studied this power, discovering and inventing new ways to manipulate these emotions to help aid a Sith in battle. Following these original teaching, the Order of the Black Wind places a great emphasis on these emotions, encouraging and even manipulating violent reactions from those that follow the teachings. Rage is a powerful emotion, but like anything, those that are also able to control their rage, as well as the rage of others are the ones who rise to the top of the food chain. Membership: Any character with a Dark Side Score of at least 1 who has been accepted by a member of the tradition can become Initiates of the Black Wind and take talents from this talent tree. Hear the Winds: Once per encounter, you can regain all expended uses of the dark rage power as a swift action. Dark Howling: You can expend one use of the dark rage Force power from your suite in order to activate this talent. Instead of the normal benefits of the dark rage power, you instead project the turbulent emotions outward instead of inward, surrounding you with a swirling cloud of rage and anger. For a number of rounds equal to your Charisma modifier (minimum 1), any adjacent opponent that attacks you takes 1d8 damage. This doesn’t affect opponent who are not adjacent to you. You can spend a Force Point to add one-half of your heroic level to the damage dealt to an attacking opponent. Smoldering Rage: You can expend one use of the dark rage Force power from your suite in order to activate this talent. Instead of the normal benefits of the dark rage power, you turn the emotions into a physical weapon. A blade of fire appears in your hand, lasting for a number of rounds equal to your Charisma modifier (minimum 1). The blade deals 2d6 damage, adding one-half your heroic level, and your Charisma modifier to the damage roll. The blade deals fire damage. You can spend a Force Point when you activate this talent to make the blade last until the end of the encounter. For all intents and purposes, the blade is treated as a light, simple weapon. Armor of Rage: You can expend one use of the dark rage Force power from your suite in order to activate this talent. Make your Use the Force check as normal, but instead of adding the bonus to your melee attack and damage rolls like normal, you get the listed bonus as DR for a number of rounds equal to your Charisma modifier (min. 1). If you spend a Force Point, you can add the bonus to your Damage Threshold as well. Link of Rage: You can expend one use of the dark rage Force power from your suite in order to activate this talent. Make your Use the Force check as normal, but instead of adding the full bonus to your melee attack and damage rolls like normal, you only get half the listed bonus. You grant one ally within 6 squares of you and within your line of the sight the other half of the bonus. If you spend a Force Point to make the dark rage last until the end of the encounter, the ally you choose must stay within 6 squares of you to maintain the benefit. If the connection is broken, you still only receive half the bonus. Rath Traynor is the younger brother of Kell Traynor, born two years after his brother. He too, was strong in the Force, but he did not have the benefit of a Jedi Master, and thus was left to his own devices to learn to control his powers. One day, the young man discovered the tomb of Lord Thraxuss, a long forgotten Sith Lord who had once ruled over a large section of the planet as an absolute tyrant in the bygone days of the Golden Age of the Sith. He discovered the Sith Lords teachings along with several ancient artifacts, which coupled with his family’s already violent nature, exhibited by him as well as his brother, quickly precipitated the young man’s fall to the dark side. He began to exert his control and influence over several of the local leaders his area, eventually taking the power for himself. He began rebuilding the Order of the Black Wind, learning to control many of the same powers that Lord Thraxuss had used in his lifetime, using his new powers and the militant force he was building up to extend his own circle of influence, eventually attracting and corrupting the likes of Skree Tontin, the powerful warlord of one of the larger countries on Niss and even his brother. He began to assert his influence in his local areas, beginning to put together a dark side cult that he ruled over like a high priest. As his power and influence began to grow, so did his organization, eventually attracting the likes of Skree Tontin and eventually his older brother, who had been expelled from the Jedi Order. The man known only as Firebrand was a member of a small group of Mandalorians, still clinging to the ways of the Crusader clans of old. However, when it was discovered he was Force sensitive, he was exiled from the clan. Eventually, guided unconsciously by the Force to a small planet in the Suarbi system where he was accepted as a member of the Jensaarai tradition. However, his demeanor and violent tendencies proved to be too much even for the Jensaarai, and he found himself exiled from their teachings as well. Eventually, he found his way to the planet Niss, once again unconsciously following a call from the Force where he discovered a small dark side cult quickly growing in power. Rath Traynor, the leader of the group found the young man’s inner rage something he could exploit, and helped to finish the young man’s fall into darkness. Rath put the young man through intense training, making him his first disciple in the recently resurrected Order of the Black Wind. Through this training, he grew to master the art of projecting the rage and hatred into a physical weapon in his hands, a talent that very few people in the order had ever managed to learn with any sort of proficiency. The blade of flame in his hands, matched with his fiery temper lent him the name Firebrand. He wades into battle with his rage as his weapon, clad in the armor worn by one of Lord Thraxuss’s apprentices. Skree Tontin was a native of the planet Niss and from a young age carved out a large section of the planet through armed force, ruling over it as a warlord for many years. Strong in the dark side of the Force, Rath Traynor sensed him when he began forming the cult, and began to put out calls through the Force, bringing the warlord to seek him out. When Skree finally found him, Rath began to exert influence over the warlord’s will, finally bringing the man into his power and absorbing Skree’s lands and forces. A sadistic man by nature, Skree loves giving pain to others, especially in combat. Sensing this, Rath put him in charge of training the soldiers of the military arm of the Order, where he has no problem culling the weak from the Order. Kell Traynor was born with a powerful connection to the Force, which was sensed by a travelling Jedi Master who had sensed the young child’s potential. However, when he got to the temple and began his training, strong violent tendencies began to appear in the boy. His teachers tried hard to curb those outbursts, but they were eventually forced to expel him from the Order when he nearly killed another student in a fit of rage during a training duel. When he returned to Niss, he found that he had a younger brother, also strong in the Force. He also found that his brother had taken over a large part of the planet and was ruling over it with the help of a dark side cult he had formed in the intervening years. Rath, sensing his older brother’s power, inner turmoil, and natural rage, brought Kelli into the Order and began instructing him in the teachings that Lord Thraxuss had given him. Rath not only accepted, but encouraged his brother’s violent outbursts, further speeding the young man down the path of imperilment. He has still not completely traveled that path, but with such violent men around him, feeding his already dangerous tendencies, it is only a matter of time. This stat block represents the professional soldier corps of the Order. Rath accepts nothing more than the best for his troops, and Skree Tontin has no problem making examples of those who aren’t up to the task. Equipped with swords and light armor, they are terrors to behold. They are trained in firearms, but due to the planetary attitude towards that form of combat, they don’t carry any ranged weapons. So there you have Niss and the Order of the Black Wind along with its leadership. Feel free to borrow, modify, or steal these ideas for your game. Just let me know how they work out for you. Ve’run has always had problems. From a young age, he had developed gambling problems and by the time he came of age, he had already accrued quite a large debt to several crime lords. He began using his species natural healing ability to make money as a doctor, teaching himself about the profession as he went, and becoming quite knowledgeable as time went on. However, between the crime lords constantly looking for him to collect their money to other doctors and political officials constantly on him for operating without a license, he was forced to pick up and move many times, constantly trying to stay one step ahead of those after him. He’s jumped from ship to ship as the years went by, learning various tips and tricks from smugglers and other outlaws that he’s made company with and still continuing to offer his services to make money and pay his way aboard different ships (not to mention his stakes at the gambling tables), using the things he’s learned in his time on the run as well as his species natural affinity for double speak and manipulation to attain the materials he needs from time to time. Ve’run can easily be dropped into most any campaign, on either side of the PCs. He can work well as a contact and healer for those characters who operate on the fringe or could be a bounty posting (either from legitimate authority or the crime lords to whom he owes money) that the characters take for some extra money. The PCs could be wounded away from a civilized planet and Ve’run could be their only option for medical aid. If they can’t pay his exorbitant prices, they may find them in the debt of this crafty physician who may use them in an attempt to “negate” some of his debt, striking back at one or more of the crime lords to whom he owes money. *in a Legacy Era Campaign, consider replacing this feat with Biotech Surgery from the Legacy Era Campaign Guide. People in the major city of your campaign world have been winding up dead. At first, people don’t pay this much mind – though the whisperings and rumors are still there – as the people dying are those that aren’t much missed, beggars and others living in the poorest areas of the city. However, as the PCs increase in power and status, so too does the status of the murder victims, starting to include skilled tradesmen, merchants, and small politicians and city officials. Eventually, as the PCs hit Paragon, they are contacted by an official who is afraid for his life and hires the PCs as night time security detail. As the PCs watch the manor over the night, they encounter and unmask a Night Hag, killing her in battle. It turns out the Night Hag has been using her ability to disguise herself to hide in the slums of the city as just another beggar woman, honing her skills on the people there and slowly working her way towards the city leadership. She sneaks into their dwellings at night, coupling her ability to cause unconsciousness in people and then slip into their minds to kill them. Unfortunately, the motives are still unknown at this point, though the official believes the threat now ended. However, the murders don’t stop. This launches an investigation for the PCs where they are able uncover the Hag’s coven, finding out their motives for killing the high ranking city officials and then stepping into the power vacuum to rule the city with several other forces. As you can see, this is a fairly versatile scenario, that you can use as either a backdrop and an aside to the main plot, or you can weave this into the main plot and introduce other elements of the Hag’s coven and a much larger threat to the city. Either way, this is best started slowly, with the PCs just getting vague whisperings about the murders going on at low levels until they can handle themselves against the coven. If they decide to become virtuous vigilantes and strike out at this hook right away, it isn’t hard to keep them out of the city. After all, the life of an adventurer isn’t complete unless he’s out slaying monsters and looting dungeons, and there’s lots of places they can be sent, through red herrings placed by the coven or otherwise. For the other beasts involved in the coven take a look at other monsters that can change their shape, or ones that could eke out an existence in a large city (or underneath said city). There you go, Gamer Nation. Have at it. Have fun with this one, and if you decide to use it in your game, let me know how it works out for you. We’ll see you next time. He is never encountered without at least one of his bodyguards, and oftentimes, at least one rifleman. When he is able to orchestrate a confrontation, he will have both bodyguards on hand, and see about getting his riflemen set up behind good enough cover where they can remain protected while taking down the enemy. Threan is by no means unable to defend himself, however, he tries to stick next to one of his two bodyguards allowing them to soak up the damage that his foes throw his way, using his darter against enemies to attempt to take opponents out of the fight with his poison before being forced to switch to more conventional means. If and when the opportunity presents itself, he will use his concussion grenades as his riflemen maneuver his foes into tight groups with their Bantha Herder feat. This is the second installment of what will be the regular Thursday feature, now renamed Threat Assessment. This, much like the first one, was a stat block I drew up in response to a request from one of the Gamer Nation over at the d20 Radio boards. He was having problems effectively challenging his Jedi characters, and wanted something that would give them a run for their money. I threw together a few stat blocks of varying levels that he could throw their way to make them dye their underpants the same color as their robes. This one was probably my favorite NPC, and can be introduced early as a higher level enemy into an ongoing game as an adversary they can work towards finally defeating. Ve’ino is a bounty hunter of no mean skill. When he encountered his first Jedi and learned that the power they commanded could not affect him, he knew that it was his destiny to destroy these warriors for the glory of the Yuuzhan Vong. He took to taking bounties that would put him close into the reach of Jedi so that he could continue to hone his techniques, eventually striking off onto his own and recruiting a number of other men to aid him in taking down more and more powerful Jedi, finding that while he couldn’t pass on his apparent immunity to the Jedi’s power, he could train them to become more resistant. In combat, Ve’ino moves into melee combat, trusting in his natural skill and heightened reflexes to keep him safe. Since he cannot be flanked or caught flat-footed by normal means, he has no qualms about getting himself surrounded, and in fact, prefers it that way so he can make full use of his Whirlwind Attack feat to strike as many foes as possible. He will use this feat against lightsaber wielders as well, knowing that they cannot use their abilities to Block the full brunt of it. He also gets 2 free squares of movement whenever a lightsaber attack misses him, which doesn’t provoke attacks of opportunity, allowing him to keep moving and force his opponents into having to provoke attacks of opportunity to re-engage him. He prefers to use his amphistaff in either the spear or whip form, allowing him to use the natural toxicity of his weapon to further augment his attacks. He is also not shy about using his Stymie talent to keep enemy Jedi from being able to fully utilize their powers in combat. Knights of the Old Republic: There have been rumors that the Yuuzhan Vong were encountered in universe as early as the Mandalorian Wars when a group of Mandalorian ships encountered a group of what appeared to be asteroids that attacked their craft. If you follow this, it isn’t hard to make Ve’ino a member of one of those task groups who wound up being shot down. Forced to find a way to survive in a strange universe that he doesn’t understand, he has to make a living somehow, and combat is something that comes naturally to a Yuuzhan Vong warrior. This era also puts him into a lot more contact with Jedi characters, allowing him to hone his skills further and further and be a constant thorn in the Order’s side. Clone Wars: Since the Yuuzhan Vong actually attacked Zonama Sekot before the Clone Wars, it makes some amount of sense that there might be few of them in universe during the actual war itself. I can see Ve’ino working very well as the leader of a mercenary outfit fighting for the CIS in order to pit himself against as many Jedi as possible, maybe even hoping to one day take down Count Dooku, Ventriss, and the Jedi wannabe, General Grievous and take over command of the CIS as a general in his own right. Dark Times/Rebellion Era: This era is a little tougher, though I can see a Vong warrior working as a soldier in the Jedi Purge after Order 66 is given. After most of the Jedi are wiped out, he loses a lot of his motivation, but this by no means makes him any less of a viable threat, especially should the PCs do something to upset him in any way that would make him want revenge. This is the best way to handle him in an era where revealing onself as a Jedi and a very short life expectancy tend to go hand in hand. New Republic: Much like Nom Anor was sent into the universe in order to help destabilize the New Republic for the approaching invasion, so to could Ve’ino have been. As he works to do this, he begins to encounter more and more Jedi as Luke Skywalker begins to reform the Jedi Order, allowing him the chance to encounter more and more of these kinds of targets, as well as helping to keep a potential enemy to the Yuuzhan Vong invasion weak. Legacy Era: Since the Vong are still in universe, this is probably the easiest era to drop Ve’ino into, and it really doesn’t take a whole lot of explanation to do so. He can be inserted in any way that you as the GM see fit. So there is Ve’ino Grah, Gamer Nation. I’ll be back a little bit later tonight to hit you with the delinquent Build of the Week you’ve been missing for a few days, and be back on Thursday (powers willing) with another installment of Threat Assessment.